Personal. Free Standing. Beautiful. Desk calendars to be seen all year round. Desk calendars look great in any work space, placing your designs right in front of people’s eyes and always being there as they plan each month. Available with a choice of silk, uncoated or gloss papers. Our desk calendars are always landscape and wiro bound across the top, so you can flip between months or rip off a page when a month is over. 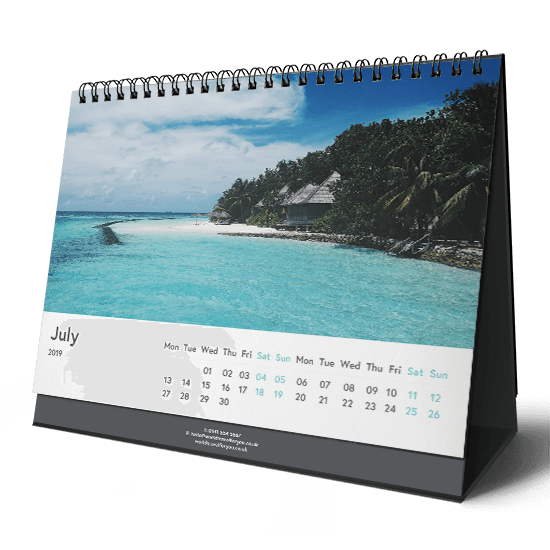 Only wiro binding is available for desk calendars. The binding will be across the top of your landscape design.